Bryson Stott went 3-for-4 with a home run and a go-ahead RBI double to power UNLV past San Jose State 9-4 in a Mountain West baseball game Sunday at Wilson Stadium. Max Smith hit a two-run homer and Dillon Johnson a two-run double for the Rebels (22-16, 9-9), who won the final two games in the three-game weekend set. The Spartans (18-18, 12-6) were outhit 12-6. Blake Berry and Troy Viola each went 2-for-4 for San Jose State, which led 3-0 entering the bottom of the third, when Stott and Smith homered to tie the game. 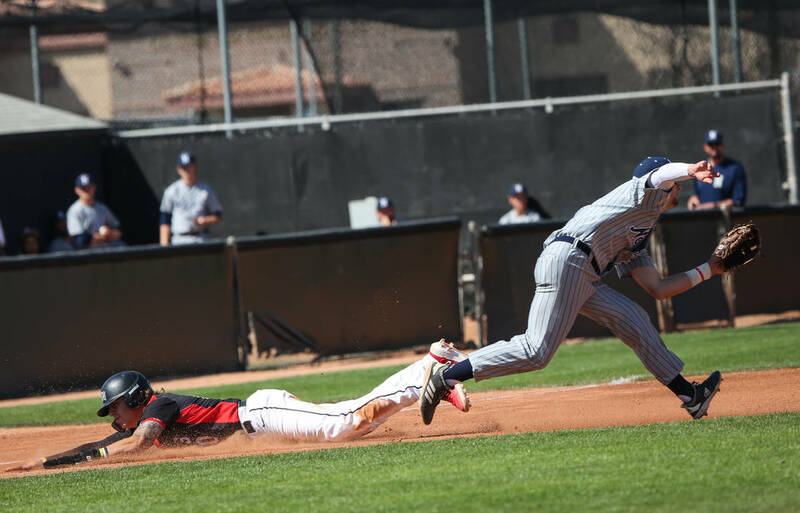 Each team scored in the fourth, and UNLV went ahead to stay on Stott’s double in the sixth. Rebels starter Chase Maddux allowed four runs, three earned, on five hits and two walks over five innings. Donavon McCrystal (2-1) pitched a perfect sixth and seventh with three strikeouts, and Matthew Mitchell shut out the Spartans on one hit over the final two innings. UNLV got to San Jose State starter Jonathan Clark for four runs on five hits and four walks over 3 2/3 innings. Nicholas Morales (0-1), the second of four Spartans relievers, gave up three runs on four hits in 1 2/3 innings. James Gamble went 2-for-4 with an RBI and scored twice, and Vince Taormina had a double and a single for the Rebels. At Fort Collins, Colo., Tara Shadowen hit a two-run homer in the sixth inning to lead Colorado State to a 4-2 victory over the Rebels. Rams starter Bridgette Hutton (13-3) shut out the Rebels (27-11, 8-6 Mountain West) until the seventh, when Samantha Diaz connected for a two-run homer. Hutton ultimately allowed two runs on five hits and one walk and struck out three over seven innings. Amber Nelson hit an RBI single and Corina Gamboa a sacrifice fly in the third for Colorado State (31-6, 13-2), which held a 9-5 edge in hits. Haley Donaldson went 2-for-3 with a double and scored for the Rams. Breana Burke (7-4) pitched the distance for UNLV, allowing four runs on nine hits and one walk. She struck out two. Statia Cermak went 2-for-3 with a double and scored for the Rebels, who dropped the final two games of the three-game weekend set after handing Colorado State its first home loss in 15 games Friday. At Colorado Springs, Colo., Eric Samuelsson won a three-set match at No. 1 singles and teamed with Clayton Alenik in a No. 1 doubles victory for the Rebels (13-7, 2-4 Mountain West) in their 4-3 loss to Air Force (12-11, 1-5). Samuelsson won 4-6, 6-3, 6-2 in singles, Alenik won 6-4, 6-1 at No. 5 singles, and they teamed for a 7-6 doubles victory. Olle Thestrup and Jordan Sauer teamed for a 7-5 victory at No. 2 doubles for UNLV, which lost its third straight match. Richard Solberg lost 6-2, 6-7, 7-6 at No. 3 singles, and Milos Dabic lost 6-7, 6-4, 7-5 at No. 4 singles.